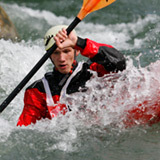 You are beginner or want advice to enjoy a rafting, kayak or hydrospeed session? 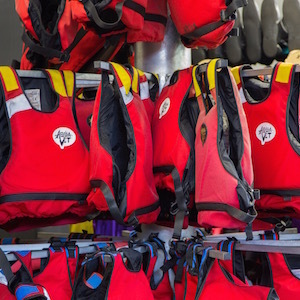 You are a beginner searching for sensation or an experimented paddler without your own material? 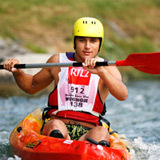 The white water park team has a rent of kayak and hydrospeed and will propose you an adapted material. White water sports don't have any secret for you and you have your own material? For you the access to the river and to his rollers is opened ! The new brochure of the White water park is now available with all our activities, course prices, rental and opening hours... download it! From 28,20 € / pers. 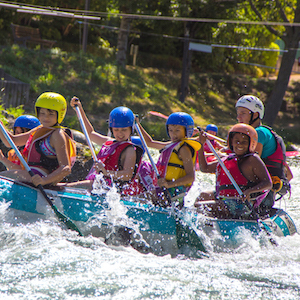 Fill up sensations with rafting at the park des eaux vives, a unique site in Alsace. From 18,30 € / pers. Maximum 10 kids per lessons : our anim'été are quite private and dedicate to your kids ! 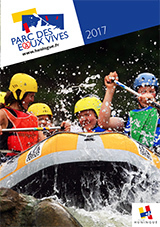 Celebrate your birthday at the Parc des eaux vives : brillant idea for fellings of hapiness ! 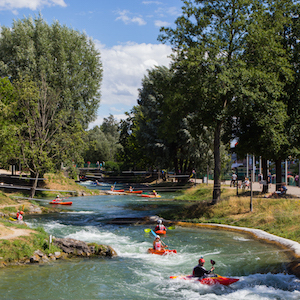 The white water park offers a wide range a kayaks for rent.